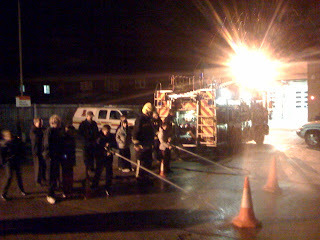 Later, one of the appliances was driven outside to the yard and several hose pipes were unreeled to give the Scouts an opportunity to squirt some water. Their challenge was to squirt water to move a traffic cone about 10 metres with the water from the hose alone. We used the smaller of the hoses to begin with before moving onto the larger hoses which required adults to help the boys hold the hose steady, such was the power of the water running through them. It was a chilly evening, so we tried to discourage the boys from getting too wet, with the promise of taking them back during the Summer to squirt more water on a warmer day. 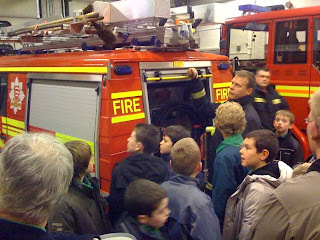 Scouts from 3rd Billericay Orion Troop visited Billericay Fire Station as part of the Community Challenge award. They gained an insight into the organisation of the Fire and Rescue service, how the various stations supported each other and how they also serve Stansted Airport in the event of an emergency. The Scouts were shown around the two appliances that are stationed at the un-manned Fire Station. This is a programme to encourage schools to take their children outdoors, no matter what the weather. The presentation today talked about how children in Foundation benefited from outdoor experiences, looking at fallen leaves, acorns, jumping over logs, following a 'night-line', firelighting and generally getting very muddy. There are often so few opportunities to get outside in the curriculum, that this initiative was about developing the curriculum around outdoor adventure at a very early age. I thought it gave children the experiences they wouldn't ordinarily receive at home, and for the older children, especially, give them real-life experience for writing reports, developing oral literacy too. The main issues for enabling this to happen will be identifying a local woodland that can be used and how to transport the pupils to the site. 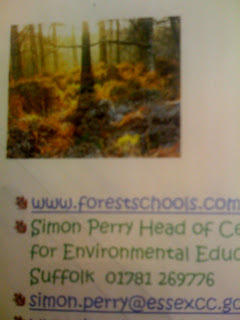 The school who presented this session used parents to drive the pupils to the woodland which isn't necessarily possible for all schools. A colleague suggested borrowing a minibus from the local secondary school as an alternative solution. Greenstead Junior School have been podcasting using an iPod Video device with a plug in microphone. The microphone makes use of the iPod's Dock connector and therefore makes recording children's voices and sounds very easy. The teachers reported that pupils weren't at all familiar with hearing their own voices played back and quickly developed their ability to speak more concisely without the teacher giving input. Pupils also improved the quality of what was spoken after several practices and wanting their recording to be absolutely perfect without coughs, sneezes and whatever else! A portable speaker system was also purchased to facilitate the playback of the iPod recordings. It was suggested the whole kit cost around £200. 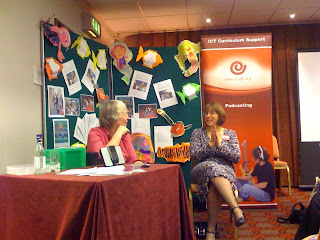 There were lots of opportunity to share the recordings with a wider audience using the Podcast function of sending it to iTunes and having the podcast feed available from there. I really like the idea of using a portable device to record the sound rather than record straight into the computer. Portability is really important, especially when you consider learning taking place everywhere, including outdoors. I'd also like to find devices which are a bit cheaper than the iPod's and as in any school, accessibility to these devices is crucial for success if pupils make decisions about their usage rather than planned in the curriculum by the teacher. It's not just the kids who have been learning a thing or two about how to dance. I've had a tremendously positive experience teaching it - an area of the curriculum I've not felt particularly confident leading before. 1. I'm more prepared to take risks than ever before. Who says that when you teach you have to be right all of the time? 2. I didn't assume a leading role, instead sharing the lead with pupils who wanted to model some dance routines. 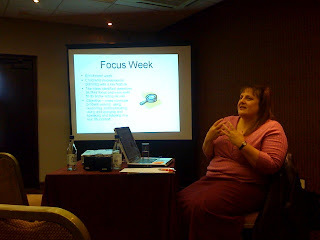 I facilitated the session rather than controlled. 3. Having the benefit of watching model dance lessons and assimilating this understanding into a style or approach that sits comfortably with me and the children. 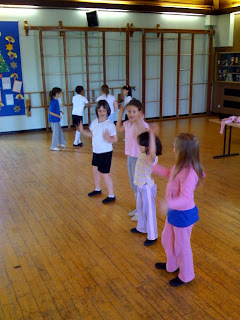 Here are two groups of girls in my class who are performing their dance to the rest of the class.